The Last Stand Against HB 1523: Repeal Effort 'Second Chance' for Mississippi? Rep. Jay Hughes, D-Oxford, along with other Senate and House Democrats, called on Speaker Philip Gunn to take up his resolution to repeal House Bill 1523. Photo by Arielle Dreher. JACKSON  Rep. Jay Hughes, D-Oxford, and other Mississippi House and Senate Democrats called on the Legislature's leadership to repeal House Bill 1523 this morning. In a press conference, Hughes introduced his resolution, called the "Mississippi Economic and Tourism Recovery Act" that would suspend the deadlines and rules to allow for an introduction of a bill to repeal House Bill 1523. "I would call upon the speaker today to allow the introduction of a suspension resolution that would allow a repeal bill to be drafted," Hughes said of Philip Gunn, R-Clinton, this morning at the Capitol. If Hughes' resolution is even brought up on the House floor, it would take a two-thirds vote to suspend the rules in order for the bill to be introduced and voted on. If it passed, then it would go to the Senate where the same process would have to go smoothly before the bill would go to Gov. Phil Bryant. Hughes said his resolution is not about places of worship. "Churches already have the right to dictate their own activities, which we would not want to interfere with, but this bill is about the economic fallout with this bill," Hughes said at the Capitol this morning. Citing travel bans and corporate condemnation, Hughes said he does not want the bill to confirm the perception that others have of Mississippi. "Our public schools in Mississippi are on life support, access to health care in Mississippi and adequate health care is on life support," Hughes said. "Our roads and bridges are crumbling, the economy is struggling, and we were short $200 million just this year, and somehow we seem focused on passing a bill that would kill our economy. So I want to have a chance to repeal this bill so that we do not become what our neighbors and strangers perceive us to be." Rep. Steve Holland, D-Plantersville, who has appeared on CNN condemning the bill, also spoke at the Capitol this morning. He said that while the bill is a sad commentary in the state's history, he's also a believer in second chances. "Today those that stand here with me and many more, quite frankly, who have come to me, especially a lot of Republicans who say 'I wish this thing had never happened,' we stand here today asking the leadership ... to give Mississippi a second chance, to repeal this bill so we can move on to the things that are important to us," Holland said. Hughes submitted his suspension resolution today, after the press conference. The House has already adjourned, so the resolution will not be taken up today. Speaker Gunn's office had not issued a response or offered comment on the resolution by press time. Several state business associations and groups, including the Mississippi Economic Council and the Mississippi Manufacturers Association, have condemned the bill. Yesterday, 95 Mississippi-born authors signed a letter calling on the state's leaders to repeal the bill. "We're simply, humbly as we can be asking today that our leader (Speaker Gunn) take this seriously and that our leader instead of punishing Mississippi will offer some redemption to Mississippi so we can move forward as a state, grow economically and help our citizens," Holland said. 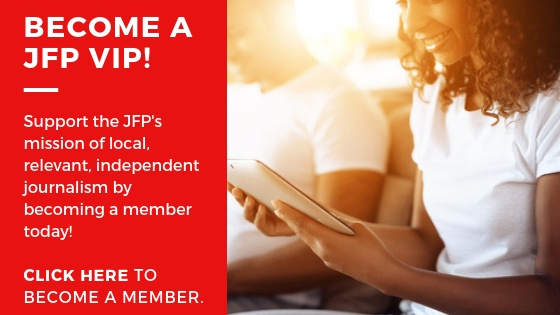 For more coverage of House Bill 1523, visit jfp.ms/lgbt. Email state reporter Arielle Dreher at Arielle@jacksonfreepress.com and follow her on Twitter @arielle_amara.